California’s Yosemite Valley has always been a land of magnificent waterfalls, mountain peaks, towering sequoias. In 1855, J.M. Hutchings formed the first tourist expedition to enter the Valley. 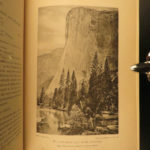 A year later, Hutchings published ‘In the Heart of the Sierras’. Hutchings was an Englishman who first learned of Yosemite’s wonders from the reports of the Mariposa Battalion. In the heart of the Sierras: the Yo Semite valley, both historical and descriptive: and scenes by the way: big tree groves: the High Sierra, with its magnificent scenery, ancient and modern glaciers, and other objects of interest: with tables of distances and altitudes, maps, etc. Yo Semite Valley: Pub. at the Old Cabin; Oakland, Cal. : Pacific Press Pub. House, 1886. First Edition. Reference: Cowan (I), p. 117; (II) pp. 299-300; Currey & Kruska 175; Farquhar 18a; Rocq 5206; Zamorano #50.